...that the Hive built shrines across the Solar System to commune with Oryx, the Taken King? "Never a dull moment, eh, Guardian?" The Gravetide Summoner is a Hive Wizard encountered on Titan when her Weekly Bounty from The Spider is active. She is fought in any of the Lost Sectors, and her location varies from day to day. Upon entering the room, three Wizards will be floating around a Hex circle, with one possessing an invincible shield. 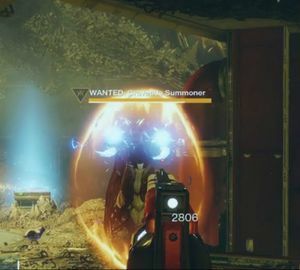 Similar to the mechanics used when fighting Kagoor in the Court of Oryx, this shield will only disappear once the summoned Gravetide Ogre is defeated. The player should prioritize the Knights with Arc Absorption shields around them, as their Boomers can surround them and deal damage when hiding from the Ogre's Eye Blast. Thralls will also continually spawn and force the player to constantly move around the arena.